A public-relations firm terminated by the Hoboken Housing Authority Board of Commissioners last month for promoting protests at two commissioners' homes has continued working for a tenants association group controlled by Hoboken Housing Director Carmelo Garcia. All County Media, the Hackensack firm of former HHA spokeswoman Lauren Zisa, issued a press release back on September 23rd, on behalf of the "Hoboken Housing Authority Tenants Association," to publicize a non-partisan event that took place on Mama Johnson Ballfield on Saturday. The event, dubbed a "Stand Up and Vote Rally," was widely seen as a Ruben Ramos campaign event designed to deter voters from supporting the Frank Raia-Beth Mason-Tim Occhipinti slate by "educating" them about the pitfalls of accepting money for absentee ballots. Garcia a recipient of hundreds of disproportionate vote-by-mail ballots himself in his last successful BoE race no longer sees eye to eye with the practice as he's opposing the Mason-Raia slate of Timmy Occhipinti, Frank Raia, Peter Biancamano and Britney Montgomery-Cook in this election. He's also been subject of a new county website story for a lawsuit successfully garnishing his HHA salary for failure to pay the bills of his 2008 BoE race. HHA counsel Charles Daglian and Director Carmelo Garcia are once again in the center of controversy. to direct an HHA tenant group protest outside the homes of board commissioners at the Sky Club. The press release cited the event organizer as thrice-failed HHA Commissioner candidate Barbara Reyes, the vice president of the Harrison Gardens Tenants Association who Garcia backed in an attempt to regain a voting majority of the seven member HHA Board overseeing his activities. What's unclear however, is in what capacity Zisa's firm is working for the tenants association. The HHA Board rejected Zisa's contract renewal for the third time at its September 12th meeting. The board also voted down Zisa's contract twice last year, pending a review of the terms of the position and a planned overhaul of the 20-years-out-of-date Web site for which she is the administrator. Some board members were initially open to reappointing Zisa to manage the website after the redesign. But that was before she was outed this past June for having issued a press release promoting a pro-Vision 20/20 protest by a Carmelo Garica directed group dubbed "Carmelitos" outside the Sky Club homes of HHA commissioners David Mello and Greg Lincoln. In that incident, the tenants association rallied outside the Sky Club demanding that Mello and Lincoln support Carmelo Garcia's undocumented Vision 20/20 plan -- ironically, just weeks after the two commissioners did exactly that by green lighting Phase 1 of the redevelopment project. When an article on a local news site announcing the protest attributed the report to "a press release from a Housing Authority spokeswoman," board member Jake Stuiver questioned Zisa about her role in the affair. According to Stuiver, Zisa claimed she did not write the release herself but merely "helped" the tenants distribute it to her media contacts. The actions raise the question how an HHA vendor contracted by the board was directed to work for a tenants association -- to help stage a protest against board members outside their homes? Who dispatched her to do so? Questions on the ethics of a contracted PR firm working with a landlord controlled tenant association were posed to HHA counsel Charles Daglian and the embattled HHA Director Carmelo Garcia more than a week ago. Unlike the previous inquiry, this yielded no email reply and certified letter. See: Garcia says no FBI investigation in the HHA. 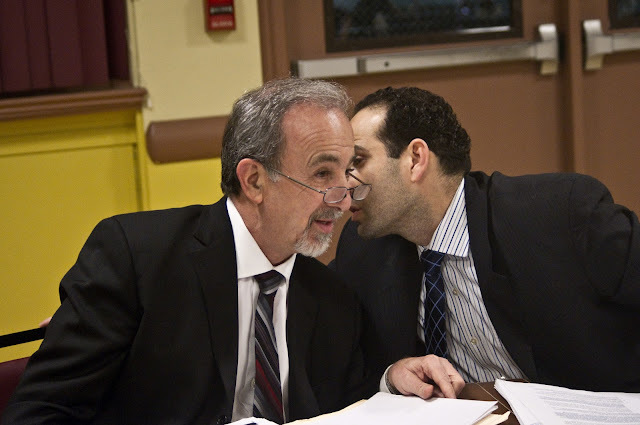 The ethical lapse by Garcia in accounting for his use of HHA funds to enlist his selected PR firm against board members who do not rubber stamp his agenda raises new questions of impropriety, a growing list from his secret recordings of officials to the litany of abuses alleged by HHA tenant Jessica Coco in the City Council meeting Wednesday night. Can Garcia arbitrarily continue to keep paying Zisa's firm as a "holdover" and direct additional "tenant" protests outside the homes of anyone in Hoboken? A flyer urging HHA residents to call the police for unsolicited activities is widely viewed as part of the continuing war in the back of the fourth ward over vote-by-mail buying. Garcia is backing friend and mayoral candidate Ruben Ramos in an attempt to discourage HHA residents from accepting payments in the $40-50 range for their votes. Adding to the war between Old Guard factions, independent legal sources are reviewing the legitimacy of the controls imposed on HHA residents' speech rights by Garcia. In the City Council meeting Wednesday night, David Liebler actively backing the Ramos campaign questioned Councilman Timmy Occhipinti challenging the VBM activities of his campaign. Occhipinti never said a word in response while Councilwoman Beth Mason left the dais before Liebler's remarks and stayed away for their entirety. Mason is again underwriting Occhipinti this election cycle. Council candidate Frank Raia (r) is seeing opposition to campaign activities in the HHA by its PR firm. of those efforts in his previous election to the Hoboken Board of Education. Garcia is backing the Ruben Ramos ticket. Talking Ed Note: Commissioners Jake Stuiver and Judy Burrell have repeatedly and unsuccessfully sought information on the HHA's financial details, and have yet to receive a complete set of employee, title and salary data even after several OPRA and FOIA requests. MSV was the first to successfully obtain Carmelo Garcia's contract with the HHA through an outside State source. Until that time, Garcia stonewalled his bosses on the HHA board refusing to allow its members to view or obtain a copy. The complete lack of transparency by Garcia raises more questions on what a hired public information officer should be doing for the HHA? Shouldn't a person in that role be making HHA public information available to the public? Or is their job to direct landlord controlled tenant groups to attack HHA board members outside of their homes and promote the Ruben Ramos ticket? Related: The Carmelitos finally show up at the Sky Club last June.